I found this solution on this forum and was able to pull some information but with the workflow we have on the list, we need more information. 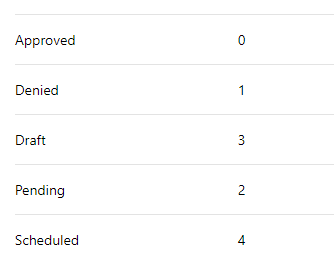 We have an "Approval Status" column that we can see when it's updated when I look at the individual item's version history. 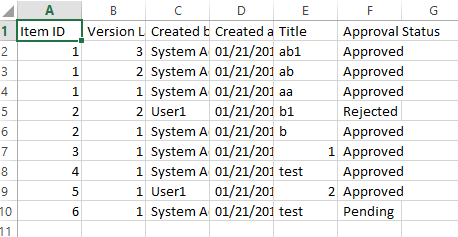 Is there a way to modify this script to include it in the report? 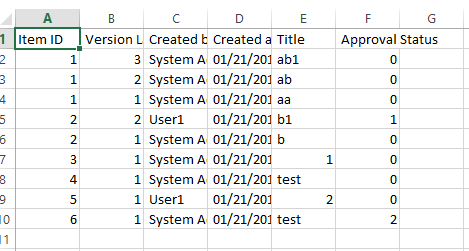 I tried adding it "Approval Status" to both places where I see the column names below but that did not work. TIA! Add-Content -Path $ReportFile -Value "Item ID, Version Lable, Created by, Created at, Title"
$VersionData = "$($item.id), $($version.VersionLabel), $($version.CreatedBy.User.DisplayName), $($version.Created), $($version['Title'])"
Write-Host "Version history has been exported successfully!" You have enabled Content Approval in the list as it has "Approval Status". Add-Content -Path $ReportFile -Value "Item ID, Version Lable, Created by, Created at, Title, Approval Status"
$VersionData = "$($item.id), $($version.VersionLabel), $($version.CreatedBy.User.DisplayName), $($version.Created), $($version['Title']), $($version['_ModerationStatus'])"
The "Approval Status" value: 0 is Approved; 1 is rejected 2 is Pending. $VersionData = "$($item.id), $($version.VersionLabel), $($version.CreatedBy.User.DisplayName), $($version.Created), $($version['Title']), $status"
Not the answer you're looking for? Browse other questions tagged 2013 sharepoint-server list powershell version-history or ask your own question.